Celebrating the life of Warren E. Ledtje Sr.
Obituary for Warren E. Ledtje Sr.
Warren Ledtje Sr., 88, of Waterloo, died Tuesday, November 20, at home. 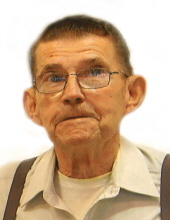 He was born August 21, 1930, in Grundy County, the son of Earnest and Alice Browne Ledtje. He married Josephine Arena in July 1949, and they later divorced and she preceded him in death on May 29, 2018. Warren was employed as a machinist at John Deere for thirty years, retiring in March 1978. Survivors include: four sons, Anthony (Connie) Ledtje of Muscatine, Joseph (Patti Lee) Ledtje of Cedar Falls, Warren Jr. (Vicky Clabby) Ledtje, and Karl Ledtje both of Waterloo; two brothers, Robert Ledtje of Elberon and Norman Ledtje of Waterloo; two sisters, Arlene Schares of Gilbertville and Gertrude Connely of Pennsylvania ; six grandchildren. Preceded in death by: his daughter, Esther Turner, four brothers, Wilbur Ledtje, Royal Ledjte, Jim Ledtje, and Ronnie Ledtje; two sisters, Doris Aasgaard and Esther Ledtje. Services: 11:30 a.m. Monday, November 26, at Hagarty-Waychoff-Grarup Funeral Service on South Street with burial in Mt. Olivet Cemetery. Public visitation one hour prior to services at the funeral home. To send flowers or a remembrance gift to the family of Warren E. Ledtje Sr., please visit our Tribute Store. "Email Address" would like to share the life celebration of Warren E. Ledtje Sr.. Click on the "link" to go to share a favorite memory or leave a condolence message for the family.